Domaine Bargylus is Syria's first private vineyard and is producing high-quality wine with European techniques. London, England (CNN) -- The fertile plains of Lebanon and Syria have been producing wine for thousands of years. Only recently, though, has the tradition come back in vogue. Today, a new crop of boutique vineyards is sprouting up and older vineyards are earning increasing critical acclaim. Meanwhile, both local and international demand for their wine is steadily growing. "Lebanon has been making some excellent wine ... The overall quality is better now than before," Jancis Robinson, wine critic for the Financial Times newspaper, told CNN. In the past five years, the number of vineyards in Lebanon has jumped from 15 to 33, according to Michael Karam, author of award-winning regional guide "The Wines of Lebanon." "Global sales from the region are picking up," said Gaston Hochar, Managing Director of Chateau Musar, a three-generation family vineyard in Lebanon that's just created a new range of products for Europe. "It's quite exciting. 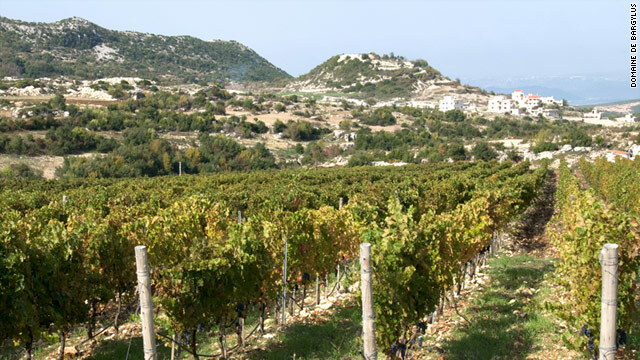 The trend is moving toward small producers of high quality wine, and not just in the Bekka Valley (where it has traditionally been made), but in the north by Mount Lebanon and in the south," Karam told CNN. Next door in Syria, the first private vineyard has just been opened by the Saade brothers, who already operate a successful estate in Lebanon -- Chateau Marsyas. "Terroir is the most important thing," said Sandro Saade, one of the co-directors of the new Domaine Bargylus vineyard, using a term that denotes the soil and climate conditions in which a wine grows. "Lebanon and Syria are both rich in limestone, which gives wine a very unique taste," he explained. "The mix of high altitude plus the weather, the soil and the quality of grapes has given us the necessary tools to make a great wine." Domaine Bargylus uses so-called "old world" techniques from France to make a high-end wine that sells in Europe for about $58 per bottle. "It's stunning ... world class," said Karam of the Domaine Bargylus wine he has tasted. In addition to the quality, the Saade brothers hope curiosity and a strong heritage will propel sales: "A wine from Syria is not something you have everyday," Saade told CNN. "It's not really a problem of positioning," he continued. "Everyone knows vines have been planted here for four to five thousand years ... The wines of Lebanon and Syria should be called 'very old world.'" Saade says that only a small segment of Syria's predominately Muslim population drinks alcohol, compared to more liberal Lebanon, where wine consumption has been rising since the end of the civil war in 1991. "Wine is now picking up in an amazing way," said Dr. Elie Karam (not related to Michael Karam), Professor of Psychology at St. George University in Beirut, who has researched drinking behavior among Lebanese people. "This has coincided with lots of people coming back to Lebanon from Europe and the U.S. having been exposed to tasting good wine. Before it was mostly two or three wineries." "Drinking has always been tolerated in Lebanon ... The Christians do drink more, but both Muslims and Christians drink here," said Michael Karam. In 1990, Chateau Musar was exporting 95 percent of their stock abroad. Today while their overall business has grown, that figure has fallen to 80 percent and 20 percent of their annual stock is bought locally. "Before, whisky was king. Now, with the end of the war, a lot of people have come back and think it's smarter to put a bottle of wine on the table," said Michael Karam. Dr. Elie Karam also attributed the increase to what he described as a growing liberalization of alcohol use. "Before, young people used to go out to dinner and have a drink with a meal ... now people go out to dinner, and then go out to drink," he said. According to Saade, Lebanon produces around 6.5 million bottles of wine annually, half which gets exported abroad. "Wine production really began in what is now Georgia and made its way down to the Mediterranean," said Michael Karam. "The Phoenicians were making wine here thousands of years ago." Under successive empires, locally grown wine in the lands of Lebanon and Syria was a popular part of culture from the Egyptians down to the Greeks, Romans, and all the way through to the Ottomans. In recent centuries, the tradition has primarily been kept alive by Jesuit monks and small family farms, such as Chateau Musar. For example, in the Syrian village of Maalula, the Greek Orthodox monastery of Saint Tekla (or Mar Taqla) has been continuously tending vines and making wine for hundreds of years. These wines tend to be sweeter than the new refined wines currently catching on in the region. "Conditions for wine making have always been superb in these countries," said Michael Karam. "But now, production and technology have improved ... The new producers have upped their game, upped their expertise."